Have a patch or patches to put on the front of a vest ??? Have an inside pocket right where you want to put the patch ??? Don't put the patch on. Sew the patch on.. sewing the pocket shut. Glue the patch on and hope it doesn't come off. Disassemble/reassemble the vest, adding to the cost. Now with our patented innovation, patches can easily be sewn onto the front panels and still keep the full use of your inside pockets. 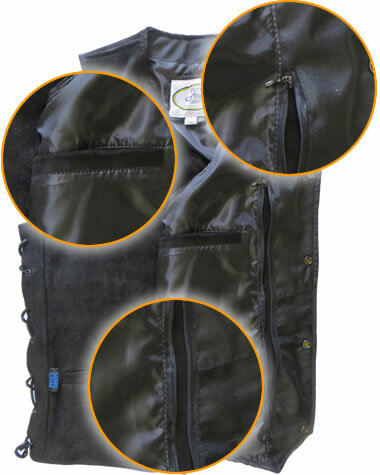 Our SOEZY® feature gives access to over 70% of the vest front and is available in all of our men's and women's vests.